Main Entrance The staircase leading up into the Cliff Dwellings. Many people have a perception of America before the Europeans came as being full of nomadic people in teepees. While that was somewhat true, there are theories that many tribes returned to nomadism in response to the changes brought about partly by the arrival of the Europeans. But in a larger trend, Native American life in the Southwest had been undergoing a huge and still scarcely explained change within the last 1000 years. Tribes had found new ways to organize around new sources of food and methods of farming and had created settlements and cities that rivaled European ones for complexity and craftsmanship. Religion spread though much of the Americas in ways that are only now beginning to be understood, which possibly had a huge impact on how people interacted with one another as well as as architectural trends. What we do know is that in much of the Southwest there was an explosion of building that happened in the 12th and 13th centuries. 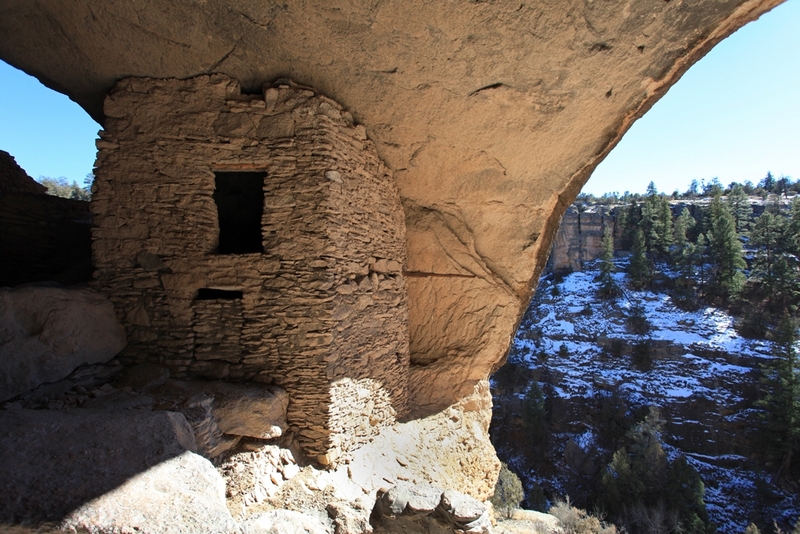 People had been building dwellings here in various forms for hundreds of years, but across all the major cultures of the southwest: the Anasazi, the Hohokam and the Mogollon, the complexity and amount of buildings seemed to increase. 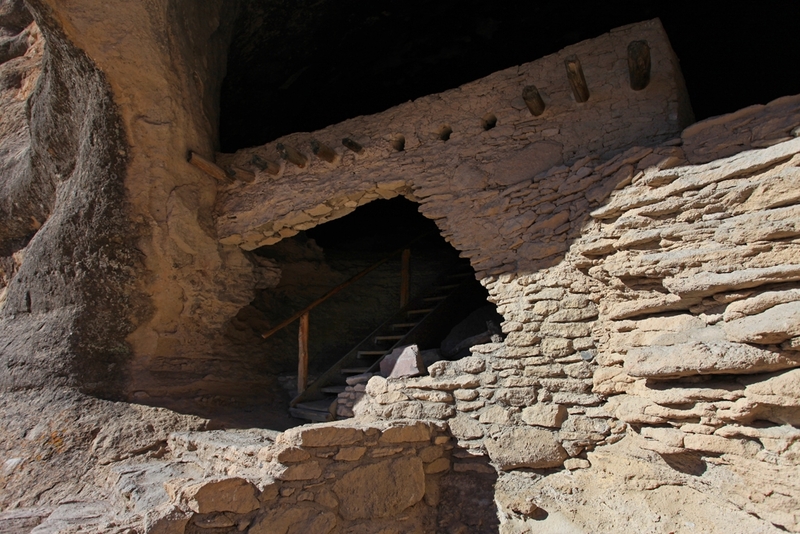 The Anazazi, centered around the massive and incredible Chaco Canyon in New Mexico, built what was the largest structure in America until the 19th century as well as the stunning community at Mesa Verde in Colorado. The Hohokam, which resided in the area spanning Tucson to north of Phoenix, built Casa Grande and Mesa Grande. And the Mogollon who spanned a huge territory covering Mexico, West Texas, Arizona, and New Mexico spawned the extraordinary graphic black and white pottery style of Mimbres and created the Gila Cliff Dwellings. While each a distinct culture, they all basically fell apart in the 1200s - 1400s. Across the Valley From the other side of the valley, showing the cliff face. What caused this has been a hotly contested area of discussion for archaeologists. Many theories point to a prolonged drought that punished the area causing food shortages. Other theories look to over crowding, which required untenable farming practices for such large populations. Another intriguing idea is that a wholesale shift in religion was sweeping through the native cultures and that the religion that drove them to build in the first place was no longer strong enough to maintain the complex structures needed for these settlements. There is even sketchy evidence of cannibalism thought to be practiced by raiding Toltecs from Mexico as a weapon of religious intimidation. Perhaps most likely all of these things conspired together to weaken the pull of these cultures. At any rate, most of these people moved on and morphed into new and other cultures. Double Arch A building built into the space between two openings in the cliff. It is one giant cave with 3 or 4 openings. 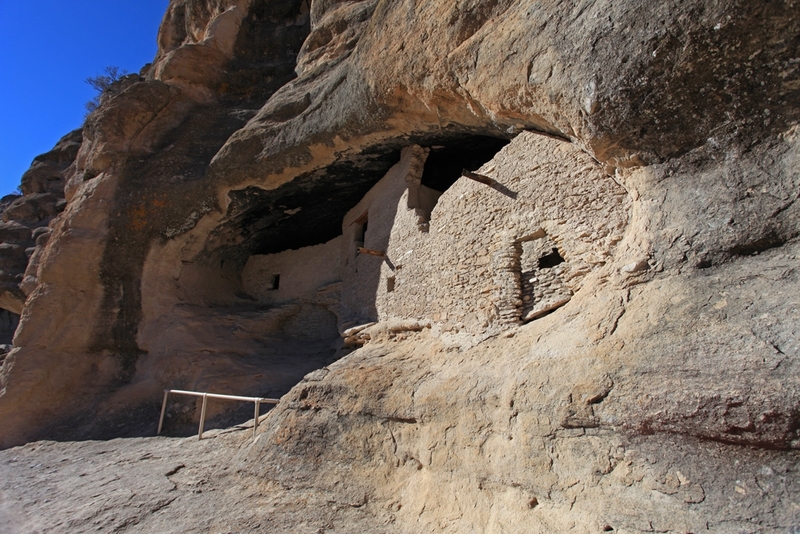 Gila Dwellings National Monument isn’t the easiest place to get to. 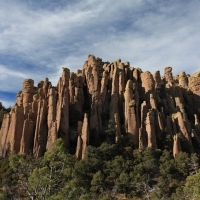 It is about 45 miles north of Silver City, New Mexico, on a strikingly beautiful road called the Trail of the Mountain Spirits that is a 1 1/2 lane ribbon of curves and trees leading deep into the mountains. We took the Miata thankfully, though there were bits of the road that were still pretty snowed in that we had to tread lightly on. Once you get there you pass a monument to where supposedly Geronimo, the vaunted Apache Chief was born. 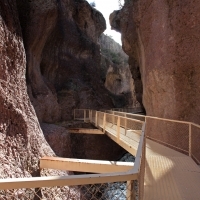 From there you head up to a parking lot and there is a mile long trail leading up to the dwellings and cliff face. Supposedly the dwellings were first discovered in 1878 by a Henry B. Ailman, a miner who, while looking to get out of jury duty arranged a prospecting trip to the Gila river where he was the first white person to see the dwellings. 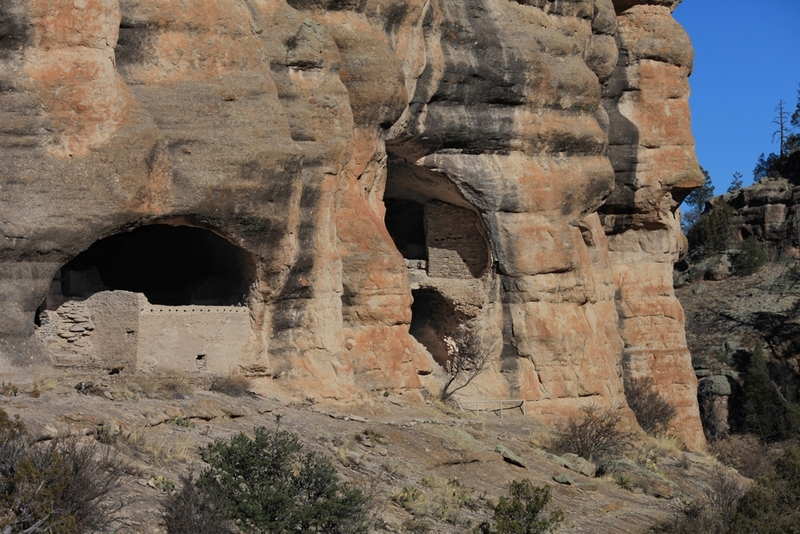 The Gila dwellings were used for a surprisingly brief period of time 1275 to 1300. The community is comprised of 5 caves with about 45 rooms. As you come up the trail you first see what is described as a communal cooking area in the first cave. Walking further along you come to the first large structure in the second cave and you get a sense of how well protected these caves could be. There are no doors and no accessible windows, only a gap between the cliff ceiling and the top of the wall to let smoke out. The only way in was by using ladders. Cliff Dwellings Map A Park Service map showing the layout of the dwellings. The third cave is the modern entrance where pot hunters broke through the wall to get inside (though it quite an aesthetic hole, it looks intentional). As you climb the steps into the main chamber you get a sense of what it was like to be in this space. I have spent a lot of time at Mesa Verde and love it, but I felt closer to the ruins here then anywhere at Mesa Verde. The space just feels more intimate and understandable here. The ceiling is totally black from the fires that were burnt inside. Once you are inside you realize that the next two caves are all connected with buildings inside and walkways and rooms connecting the complex together. Opening #2 The second opening into the cliff face. This part was not accessible from the outside. The fourth and fifth caves look out over the valley below and have some beautiful buildings in them. It was hard for me not to think like an architect here and imagine the interplay of natural space with the buildings. Just simple things to make the natural space that was already there inhabitable. John Lautner and the organic architects approached many of their desert projects with the same spirit and you can feel these cliff dwellings in their contemporary buildings. It’s a beautiful drive, it only costs $3 and it’s a great way to experience an incredible period of native life in the southwest.